EDITORS NOTE: This is the fourth in a series featuring the 12 Brazilian cities that will host 2014 FIFA World Cup events. Brazil launched its 100-day 2014 FIFA World Cup countdown clock three weeks ago, meaning fewer than 80 days remain until world’s most highly anticipated football event (soccer to U.S. types) begins June 12 in Sao Paulo. Belo Horizonte, Brazil’s sixth largest city, which will host World Cup matches on June 14 (Colombia versus Greece), June 17 (Belgium versus Algeria), June 21 (Argentina versus Iran) and June 24 (Costa Rica versus England). The capital of the Brazilian state of Minas Gerais, Belo Horizonte, which in English translates as “beautiful horizon,” is perfectly named. Visitors to the city will find a municipality marked by spectacular outdoor attractions, both natural and man-made. The city is also one of Brazil’s historic football centers, and home to the Brazilian Football Museum. History lesson: Built on a series of hills and completely surrounded by mountains, Belo Horizonte is the modern descendant of a small village founded in the early 18th century. The contemporary city was a planned municipality, built in the 1890s to replace Ouro Preto as the capital of the Brazilian state of Minas Gerais. Ouro Preto (which translates as "black gold" in reference to the gold-embedded dark rocks found on in the region), was a symbol of colonial Brazil, whose income was dependent on mining, and when Brazil became a republic in 1889, a new capital was founded in Curral Del Rey, the forerunner to Belo Horizonte. Urban planner Aarao Reis was hired to design the new capital city. Inspired by the urban planning of Washington D.C., he created a downtown grid of symmetrical perpendicular and diagonal streets named after Brazil’s states and indigenous tribes. In 1906, the city’s name was changed to Belo Horizonte. 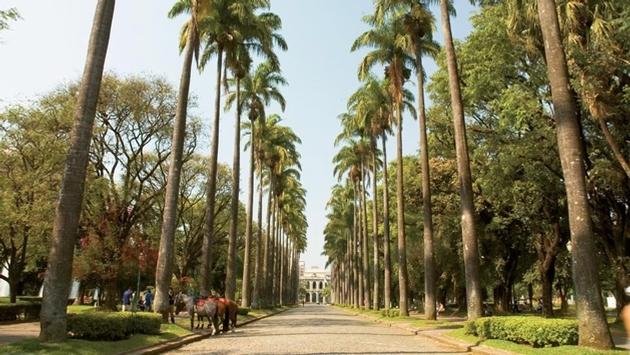 The city is also home to a mixture of contemporary and classical buildings including various works by famed architect Oscar Niemeyer, most notably the Pampulha neighborhood, which features wide avenues, large lakes, parks, and soaring contemporary structures. These include the Sao Francisco de Assisi Church, (“Igreja da Pampulha”) and the Mineirão Football Stadium, one of the world’s largest. The Mangabeiras Park (“Parque das Mangabeiras”), located in the hills four miles outside of the city, offers sweeping views of Belo Horizonte. The Jambeiro Woods (“Mata do Jambeiro”) is a 2,250-acre nature reserve featuring more than 100 species of birds and 10 species of mammals. Must see: Located just over an hour from Belo Horizonte, the Inhotim institute combines a contemporary art museum with a botanical garden. The institute houses a collection of internationally significant artwork, displayed in galleries and open-air settings framed by beautiful gardens. Rare plant species are located throughout the site, in addition to five lakes and an area of preserved forest. The one-time capital of Ouro Preto, also outside of Belo Horizonte, features one of the world’s largest collections of baroque art. Embedded in a mountain valley, this World Heritage City is a showcase of the architecture of Brazil's colonial period. The old Vila Rica features steep cobbled streets and treasures including the Igreja de Nossa Senhora do Pilar, decorated with more than 880 pounds of gold. Getting in, getting around: There are currently no airlines flying directly from the U.S. to Belo Horizonte. However most of the carriers flying to Brazil from the U.S. (including American Airlines, Avianca, Delta Airlines, LAN Airlines, TAM Airlines, U.S. Airways and United Airlines) fly to Sao Paulo, Rio, Manaus or Brasilia, from where travelers can connect to flights to Belo Horizonte. Belo Horizonte is connected to the rest of Minas Gerais by a number of roadways; the state has the country's largest highway network. The bus system features lines traveling through all parts in the city. The Belo Horizonte Metro or MetroBH began operating in the 1970s and features one line that transports more than 160,000 people each day. Insider Tip: The “mineiro” (person from the state of Minas Gerais) speaks slowly and calls almost everything a “trem” (train), except for the very means of transportation that has the same name. Brazilians often poke fun at this charming practice.